When the desktop oil rig is simply too large to lug around town, it’s time for a portable dabber. Just five years ago, before legalized cannabis started to spread in America, I’d be sitting in a public pot activist meeting listening to a lawyer speak, when one of the crew would fire up a propane torch and start heating the nail on their hash oil paraphernalia. The dramatic sound of pressurized gas furiously escaping the nozzle and igniting into a continuous flame was near-impossible to ignore, as was the greatly-increased risk of burning down the building. Dear God, how many of these people are carrying blow torches in their hand bags? We’ve come a long way, and dab rigs with electronically-controlled heating elements provide safety, ease of use and temperature control that open-flame torches lack. Still, electronic rigs tend to be bulky and sometimes boxy. My favorite treat to myself lately is an oil hit from the all-glass VapeXhale Cloud Evo, which is comically unportable. Portable vape pens are a good option, but they don’t provide that holy-crap-what-happened reboot like a dab of hash oil hitting your ctrl-alt-delete keys. And sometimes you want that mental cache clearing. Sometimes you want to get decidedly high. The Dr. Dabber Boost is a portable, battery-powered hash oil rig. 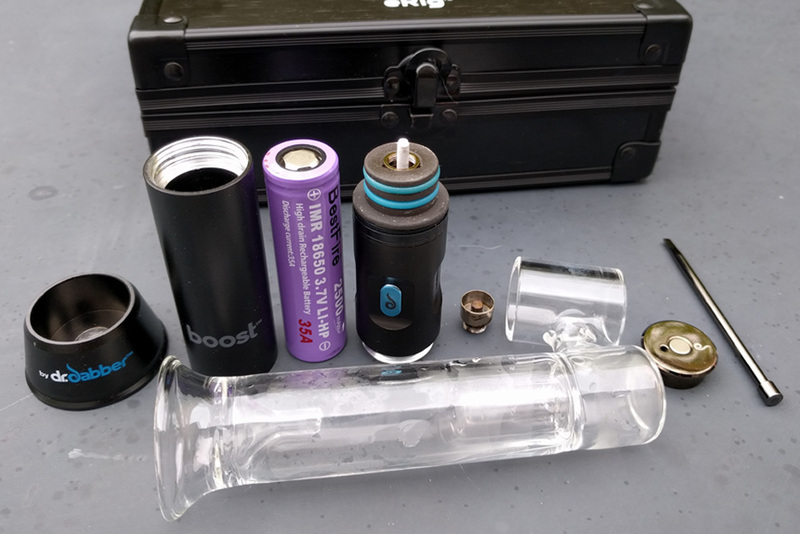 The body stands about 5.5 inches tall and holds a battery (18650-sized, BestFire-branded, 2500 mAh, 35-amp overly-optimistic rating) that powers a protruding ceramic heating rod on top of which slips a titanium, ceramic or quartz nail. A spill-resistant glass percolator mouthpiece about 4.5 inches tall snugly attaches to the body. Combined, the Boost stands about 10 inches tall. 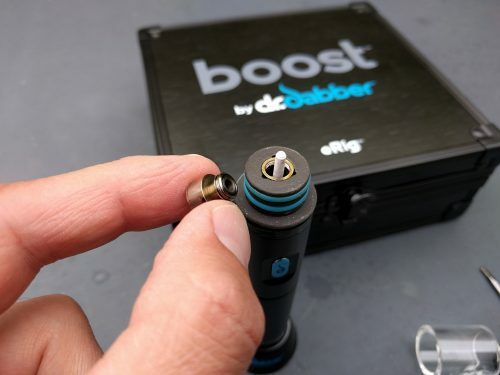 The Boost appears to be a rebranded Greenlightvapes G9 Hand-Enail, which other white labelers sell as the Dabado Bolt, Dabbie and other monikers. Myriad manufacturers sell knockoff versions on Alibaba and DHgate, though Greenlightvapes recently announced it is suing those manufacturers. The newest generation of the H-Enail includes three screw-in nails made from ceramic, titanium and quartz glass. 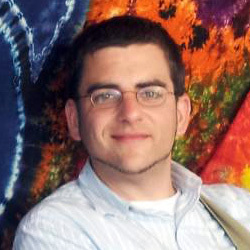 A ceramic top replaces the Teflon top used in earlier versions that had raised fears of polymer fume fever in some users unaccustomed to getting high with polytetrafluoroethylene pot paraphernalia. The indicator LED starts out white, turning blue after 25 or 40 seconds, depending on whether you clicked the device three times or five. The temperature should be around 515 degrees Fahrenheit, and after another 20 seconds of heating, should reach more than 600 degrees before the heater turns off. When that LED turns blue, dab some oil onto the nail, place the carb cap over it and inhale. To run it even hotter, start it up a second time immediately after the first heat cycle completes. The Dr. Dabber Boost is a likable little dab rig. First and foremost, it functions well, producing potent clouds of atomized cannabinoids beyond what most portable pens can generate. 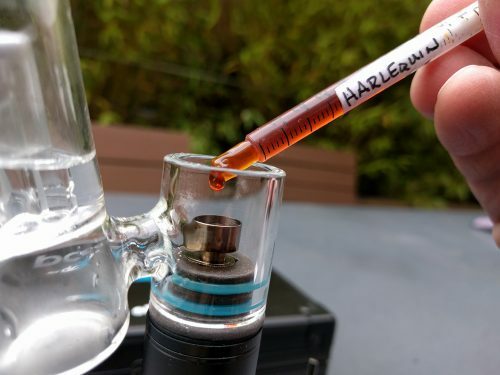 I started my testing with a high-cannabidiol extract from the Harlequin plant that I obtained from WAMOil, the closest oil processor to my south Seattle home. I’m game for most anything, and oil’s oil, right? Fifteen minutes later I couldn’t muster the mental willpower to command my motor functions to move my body from the living room chair. It was stereotypical stoner couch lock, something I’m unaccustomed to. It was pleasant, not worrisome, like I imagined moving my body was possible if absolutely necessary — oven fire, earthquake, volcanic eruption — I simply lacked any desire to do so. “So I think the little dab rig works,” I mumbled half-heartedly. It looks and feels nice too. The body is mostly metal and feels sturdy, and the glass is super classy. The thought put into the attachment points shines through. Friction from two o-rings keeps the glass percolator snugly on the ceramic top. A weighted base attaches to the body with neodymium magnets. The carb cap has a detachable handle that also uses a magnet. I have a sweet spot for both functional glass and powerful magnets, so I feel small joy just working the device. It travels perfectly in the included foam-padded carrying case. On the downside, the Dr. Dabber Boost is certainly no desktop e-nail, and doesn’t run as hot or have actual temperature control. It operates for 45 to 60 seconds and the temperature constantly increases during that time. For those used to consistently-maintained, high-temperature dabbing, the Boost may frustrate. And when I put the ceramic nail through a dry run, it produced a faint trail of smoke that didn’t seem to lessen after a half-dozen runs, aborting all ceramic nail testing. Don’t know what that’s about, but it seems best avoided. The Boost is a sweet little portable dab rig — as is any other latest-generation H-Enail rebrand, I presume. Cannabis consumers pay a premium for importers to customize generic vaporizers with some other logo, but I balk at the thought of paying twice the attainable price to get, more or less, a custom keychain in my padded mini-case. Frugal reticence aside, I really like the Dr. Dabber Boost. The Dr. Dabber Boost retails for $199.95 and is available at DrDabber.com.